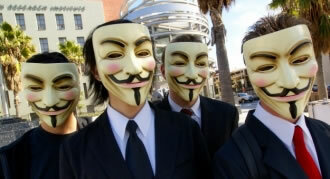 Anonymous continues to target government and film industry websites as part of the so-called operation MegaUpload, in protest of the file sharing service's recent shutdown. As it stands right now top MegaUpload executives, including its controversial founder Kim Dotcom, stand accused of running an "international organized criminal enterprise allegedly responsible for massive worldwide online piracy." The infamous hacker collective's latest target is one of the Federal Trade Commission’s websites, onguardonline.gov. If SOPA/PIPA/ACTA passes we will wage a relentless war against the corporate internet, destroying dozens upon dozens of government and company websites. As you are reading this we are amassing our allied armies of darkness, preparing boatloads of stolen booty for our next raid. We are sitting on hundreds of rooted servers getting ready to drop all your mysql dumps and mail spools. Your passwords? Your precious bank accounts? Even your online dating details?! You ain’t even trying to step to this. As has become the norm with Anonymous, the hacker group published all of the data obtained on Pastebin. The FTC responded on its Twitter account, tweeting, "OnGuardOnline.gov run by the FTC was hacked earlier today. The FTC takes this malicious act seriously." They further tweeted that the website had been taken offline, and would be back up once they were satisfied any vulnerability had been patched. As of this writing the website remains offline. In the last week Anonymous has targeted all manner of websites belonging to the media industry, which support the proposed SOPA and PIPA legislation. They also faced up against government sites, taking down the White House website, as well as knocking offline the FBI and DOJ, among several others. Despite the hacker's increased activity in the last week, the planned attack on Monday against Sony in retaliation for its support of SOPA passed without any major incident. Sony’s website was down for 13 hours for “routine maintenance” at precisely the same time as the hackers planned to attack it. Official Anonymous channels on Twitter have also confirmed that the scheduled attack on Facebook was a hoax, mirroring previous rumors that it planned to attack the social networking giant on November 5. Facebook, with around 60,000 servers, has stated it is prepared should the hacktivists change their mind.